I got a little bit of a late start coming out of Sierra City. Shortly after I started my day, I passed the 1200 mile marker! The 1200 mile marker was one of my favorites. I was pretty excited to be almost halfway to Canada!! More importantly, almost through California! The day started with a 3,000 foot climb. It was over an 8 mile span, but 5 of the miles were exposed, in 85 degrees with full sunshine. It was a hot start to the day. Wildflowers were my favorite on this day. The exposed climb, resulted in pretty awesome views. It was a nice change to a bit of a boring section of the trail. The green mountainous views throughout the day, revealed quite a few lakes hidden amongst the beautiful lush trees. One that stood out to me the most, was Deer Lake. I searched my trail map in hopes of coming close to one of these beautiful lakes and taking a swim to cool off. Summit Lake was coming up, so I was super eager to swim and full up on water. As I approached the lake, slightly off trail, it was not like the others. It was more like a pond… one in which you would never want to swim in. I was slightly disappointed, but I was sure more opportunities would arise in the future. There were quite a few waterless, hot stretches. It wasn’t my favorite day. I wanted to make it a bit further, but getting the late start and being super sluggish with the initial climb of the day, resulted in a lower mileage day. I set up camp, cooked and started to drift off to sleep. Initially my mind couldn’t tell if I was dreaming or awake when I started to hear the noises. When realizing that I was awake, my mind and body went into the good old fight or flight response. My heart started to race. I could feel my heart beating throughout my entire body. My breathing started to speed up, although trying to stay quiet at the same time. My hands became clamy. I was definitely ready for flight… not so sure about the fight. Stupid deer. I was equally relieved as I was annoyed. The deer stalked me all night. The deer were not scared of people in this section. I must have been in his/her sleeping area, because it would not leave me alone. This wouldn’t be the last time the deer stalked me throughout the night though. I never would have guessed I would be back, in what seemed like the desert again; searching for water, coming close to running out of water, and hiking extra miles in search of water. After the desert, I had decreased my carrying capacity to 1.5 liters of water, but soon realized I needed to get another liter water bottle, to make my life easier and to keep up on hydration. It was a very hot day. I read that the Middle Fork Feather River was one of the best swimming spots on the trail, so I really wanted to make it there at a decent time. I wasn’t sure if I was up to a 30 mile day again, but I was going to try. I also had hopes that my friend Ranger may have slowed down a bit to hang out and swim for the day. I was sure he was long gone though. I kept up a 3 mile per hour pace the entire day, which was pretty easy in a mainly forested hike. The last several miles were steeply downhill to the river. As I approached the river and found myself alone, and a bit lonely, I realized that the hope of Ranger slowing down, was unrealistic. We are both very independent, very stubborn, used to hiking alone, individuals. Having to stay in South Lake Tahoe for severa extra days, put me behind all of the familiar faces in my hiking bubble. All of my friends, were several days ahead of me. Ranger was the only familiar face since South Lake Tahoe. I knew I would meet new people though, but it wasn’t going to be easy for this introverted gal. My pitty party quickly ended and my spirits soon lifted as I crossed the river on a beautiful wooden bridge, imagining how great it was going to feel when I jumped in. I had never leisurely swam in a river before, only crossed ice cold, waste and chest deep “streams” in the Sierra. It was about time to change that. I hurried to the north side of the bridge and eagerly started walking toward the river bank. As I got closer, I took my eyes off the trail and looked up for a split second. The straw hat, scruffy beard, and Ranger’s welcoming face were standing a few feet from me. The only thing I could say before running to hug him was, “What are you doing here”? What a stupid question. There were so many better things I could have said in that moment, but I’m good at making things awkward. Things were never awkward between us though. It wasn’t long before I tossed aside the sweat drenched shirt, worn down shoes and foul smelling socks, that Ranger and I were swimming in the wide, deep waters of the river. It also wasn’t long before my flip flop slipped off my foot and was taken by the swift moving current. Quicker than I could blink, Ranger took a dive and started swimming after my $5.00 purple flip flop. There were several rocks in his way and I was holding my breath, praying he didn’t get hurt trying to save my shoe. He didn’t though, and he saved my shoe. As he swam against the strong current back to me, he proudly held up the flip flop. When he reached me, he put the flip flop in my hand and said “please tell me you still have the other one”. Well, here’s the thing about the other shoe… just kidding. I still had it! This is the day that Ranger saved my shoe. It felt awesome to get cleaned up, cooled off and refreshed with good company. A few other people I had been leap frogging with throughout the day, came to camp and we all enjoyed a campfire while eating dinner and roasting marshmallows. The steep afternoon descent left us camping below 2900 feet. It was kind of hard to believe, a few weeks prior, I had been above 14,000 feet! I slept so wonderfully compared to the night prior with the stalker deer. Ranger decided to take a morning swim and as I went over to meet him by the rocky river shore, I must have awoken a swarm of wasps without realizing it. 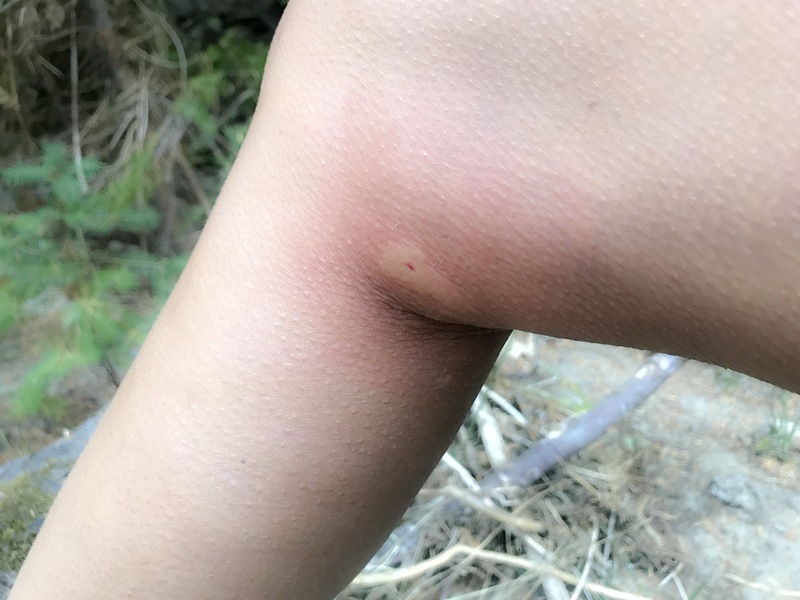 Upon waking the same way back to our camping area, I felt an intense sting behind my knee, resulting in severe pain. Before I could look around, I felt another horrible sting on the other leg. I looked around, while trying to walk faster on the large Rocks, in my cheap flip flops. I now realized that I was in the midst of a swarm of wasps. Thankfully, I made it back to camp without getting stung again. Sometimes I imagined I was in the hunger games, or survivor. 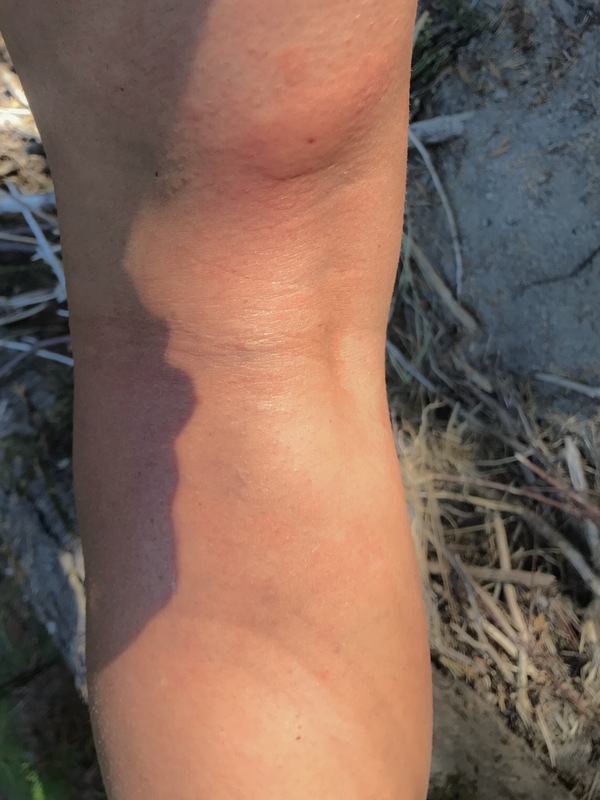 I was very grateful I was only stung twice on my legs, as there were at least 100 of them. It could have been so much worse. Although I wasn’t a fan of wasps at this moment, it’s pretty remarkable how some wasps make their nests. If you’re bored, you should Google it! Imagine walking along a wilderness trail and coming across a book box. This was one of the many reasons I loved the PCT. Random book boxes, coolers, cheesecakes, and the wonderful trail angels who supply these items. I had officially decided I was not a fan of this section of the PCT. There were a lot of trees, spiderwebs = spiders, slugs, wasps, bears, and rattlesnakes. It was very hot, dry and barely any vistas. As the day went on, Ranger and I ran into Dennis. 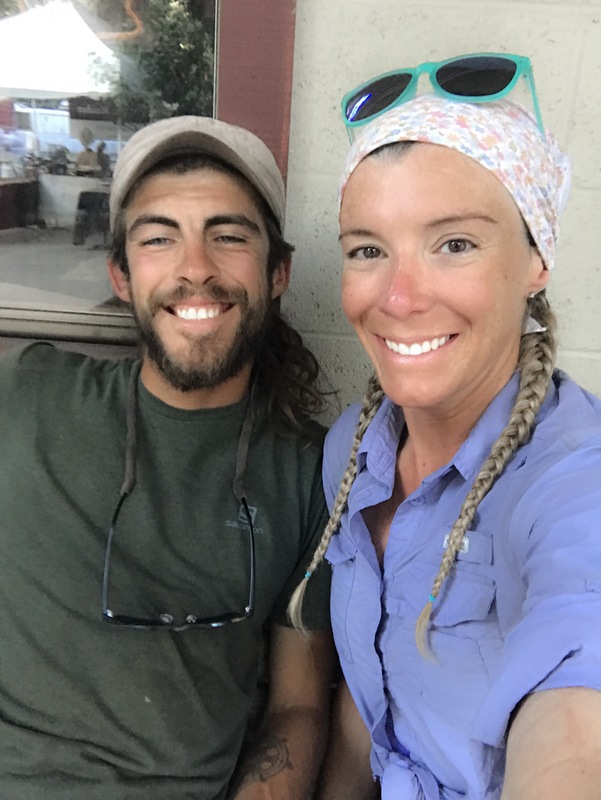 Dennis was a trail angel/PCT day hiker, going northbound in his van, doing day hikes along the PCT. Dannie gave us peanuts and a wonderfully juicy apple. Another thru hiker who we started becoming friends with, Hikerbox, mentioned a hot meal at Bucks Lake Resort, a few miles off trail. We all decided to make a pit stop there for a delicious meal, before continuing on. Dennis was wonderful and not only drove us there, but enjoyed a meal with us, and drove us back! Thank you Dennis!! After finding our way back to the trail, we started climbing Bucks Summit. 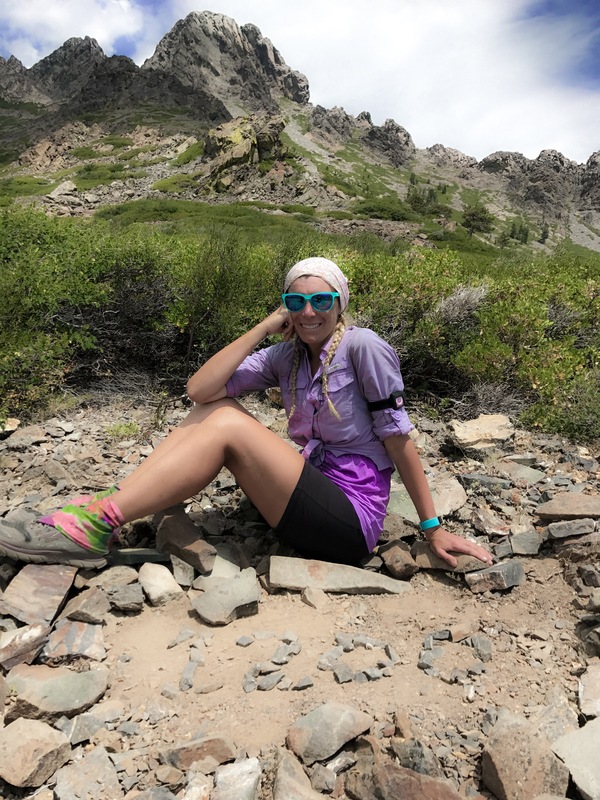 It was a particularly painful climb, as my tummy was full and my body ready to rest and digest all of the food I consumed. Our tummies and bodies didn’t allow us to go much farther after our bout of binge eating. 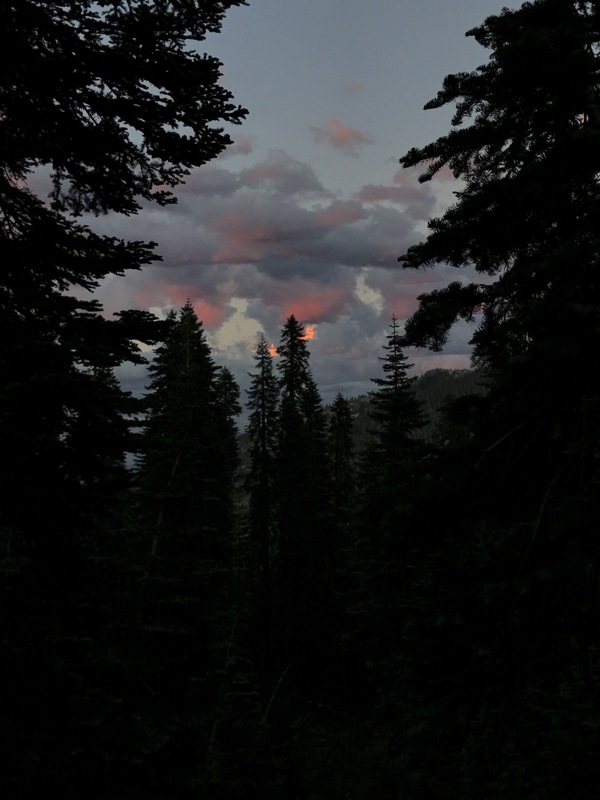 We came to the next camping area, walked through the obvious camp sites, through the dense trees, and came to an beautiful vista overlooking lush green trees, beautiful mountain ranges in the distance and the beautiful colors of the the sun disappearing behind the horizon. I loved finding perfect vistas to set up camp. After watching the sunrise at our vista camping spot, Ranger and I had made the decision to get to Belden and treat outselves to a night in a hotel. A cold shower and soda were exactly what was needed in the midst of the heat wave. Temperatures had been in the high 90’s all week and weren’t dropping in the near future. We managed to make great time into Belden, as the last several miles were downhill and we pretty much ran into “town”. What we didn’t realize is that there was a rave going on in Belden, resulting in all the rooms and campsites in the area, being booked. Apparently, there are several raves a year in Belden. Belden had one of my top 3 cheeseburgers on trail! Mmmm!! I showered, did laundry, and packed up. Before starting the PCT, I took a one day ice axe class, taught by a wonderful man who is hiking the oct in 2018. He offered it only to PCT hikers because of the high snow year. I met SoFull for the first time while taking this class. I ran into him in Belden for the first time since the class. Unbeknownst at the time, we would become great friends in the near future. The 14 mile, 5,750 foot climb out of Belden, was notorious for being the longest climb with the most gain in elevation, along on the PCT. Ranger and I decided to night hike this, so we lounged around the restaurant, waiting for sun to fall into the horizon. Ranger and I set out just before the sun bid us farewell. I thought that the sun would take the heat with it, but it was still a rather hot, but better than it had been several hours prior. I had a lot more energy than I thought I was going to and hiking seemed easy, but the time always flew by, no matter the conditions of the trail, when I was hiking with Ranger. It wasn’t long before the temperature became bearable. It was a very enjoyable night. After several miles, we came to a very exposed field. I stopped, turned off my head lamp and looked up. Ranger soon followed. We were frozen, in awe of the stars dancing with light above our seemingly small bodies. I’ve seen stars all around the United States and a few other countries. The stars always steel my attention, but only a few stargazing nights have made a lifelong impression in my memory. This, this night was one of them. I had the idea of hiking the PCT and start gazing every night before falling asleep in my tent. Reality – I was in bed before it was dark 94% of the the time, too scared to stick my head outside my tent 3% of the time, and too cold 2% of the time. So, the 1% of the time, typically while night hiking, I did see the stars, but on that night, with those stars… I’ll never forget. Around 2 am, I was getting pretty tired, so we quickly found a spot to camp and slept until the heat from the sun awoke us. Yea… I know it’s kind of odd commenting now that I’m done. Sorry I couldn’t keep up!! I was stung last year on the trail five times. Twice I was stung on the knee and those were the worst as they affected each step I took. I hope your stings weren’t too bad. Oh man!! On the knee?!? I can only imagine!! How were your first couple of weeks after the trail? The post trail funk hit me hard. It took 3 weeks to get temporarily get past it, but even now it still lingers. I imagine that will be the case until I start another long distance hike. Hopefully that will start soon. Now that you are done, can you include dates in your posts? 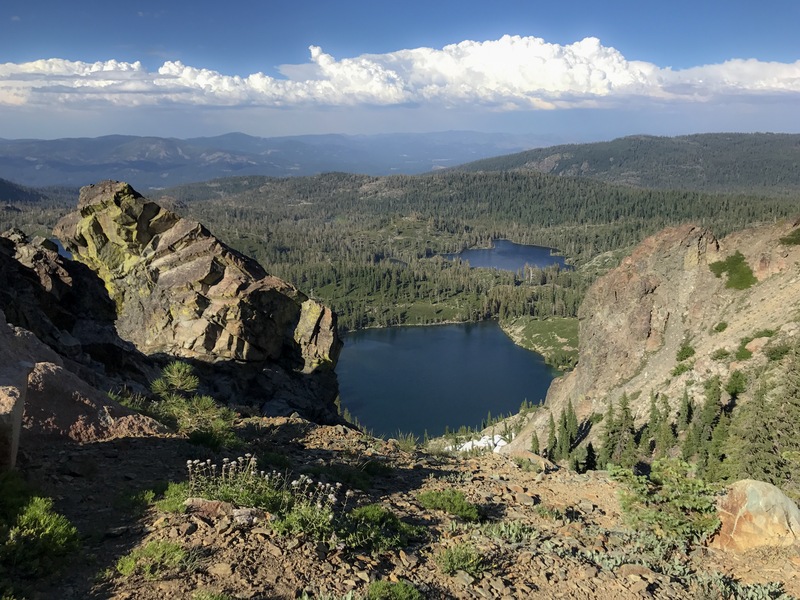 I section hiked from Tuolumne Meadow to Chester, August 21 to September 12. I left Belden at 2PM, and the burn area north of Belden was very hot. My sun umbrella barely helped. The stream crossings in Yosemite were easy (knee deep), not much snow, and rarely very hot. I have only 325 miles left to finish the PCT next year (Chester to Seiad Valley). It has only taken 22 years so far. I was following your blog before my hike. I was looking forward to learning about the stream/snow conditions were like between Tuolumne Meadow and Sonora Pass, but your posts didn’t appear in time :-(, and I think you did it a month before me. I am glad it went well. Happy trekking. I was in Yosemite Valley on July 4th, and I believe I got to Tuolumne Meadows on the 2nd. So, about a month and a half before you. I would gladly put dates in my posts now and can even go back and put them in the old posts! That’s really awesome that you’ve continued to purse hiking the entire trail over the last 22 years! I can only imagine how you will feel next year! Congratulations to you on what you have accomplished and a huge congratulations on what you will accomplish next year!! P.S., Part of the trail was rerouted recently in this section. 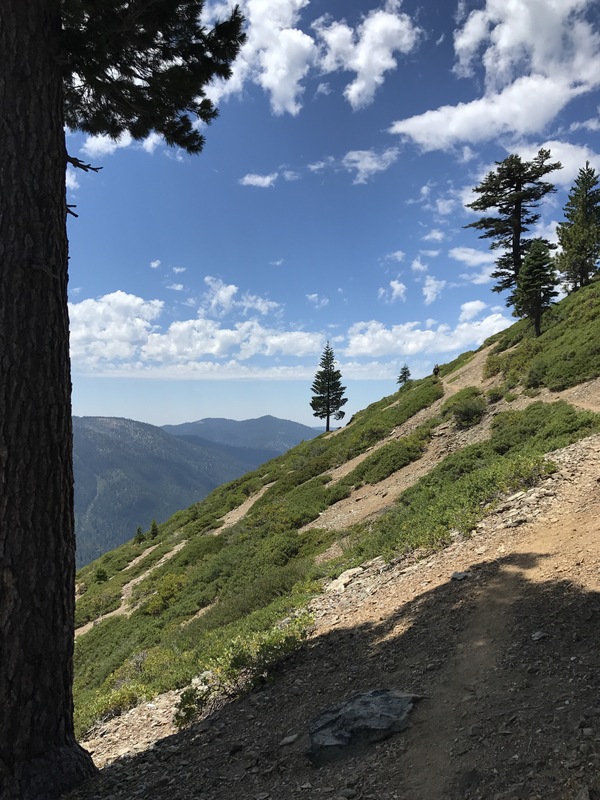 The new section is 6.5 miles and starts at halfmile 2104 (Sierra Butte trail junction). It goes past Tamarack Lakes and Pack Saddle CG (portable water). It rejoins the PCT near halfmile 1208 after going past Deer Lake. There is still some work to do next year on the new section. I love the image of the stalking deer (grinning). I think all solo hikers/campers have experienced something similar.